So far we have dealt with the question of when you should accept a double. The decision when to give a double is just as important and even more difficult. It is easy to make the mistake of feeling that this topic is not absolutely vital. If you are in a position to think about doubling, you are obviously doing well in the game. But look at it from Black's point of view. He is critically interested in whether you double or not. If you seem to be thinking	of doubling when he feels it is too early, then he is silently begging you to double. There is nothing better than to be doubled too early and have all	the advantages of having the cube on your side of the board. Black will be envisaging a shift in the game in his favour, so that he can double you back	to 4 and perhaps win a gammon for a very satisfactory eight point win. On the other hand, if his position is bad and he feels that you ought to double him, he is dreading it. He probably has not decided whether to take or drop and would like a couple of 'free throws' to make up his mind. So you must charge him for the privilege of playing on. 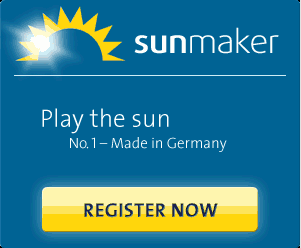 You are, in fact, very easy to play against if you double either too early or too late. You may be moving your men well, and even taking good decisions when you are offered doubles, and yet find yourself losing money. What is going on? It is probably not that you are being very unlucky. It is simply that you are doubling too early or too late. Just look at the swing of winning 1 instead of 4. That's what happens when you leave the double one throw too late, so that Black drops instead of losing a gammon. So how should you decide when to double? Some writers say that it depends on how great the odds are in your favour. They say you should double when the odds are three to two in your favour, or something like that. But that is not the way to look at it. It is true that you never think of doubling unless	you have the advantage. But it is by no means only a question of how great your advantage is. Suppose that, although you have the better of it, you can	see that, after Black's next throw, he will still be right to accept a double. In that case you must certainly not double him now. Diagram is an example. You have the advantage because you will enter your man from the bar three times out of four, and you have an excellent chance of detaining Black's back man long enough to win a runner. But there is no point whatever in doubling. Even if you get your best throw, double 6, enabling you to point on Black, and he does not come in, he still has a clear take of your double next time. So there was no point in doubling a turn earlier. 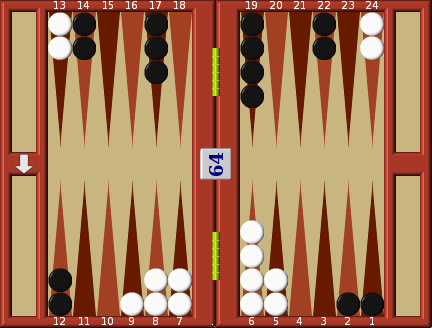 If, on the other hand, Black gets out with 6-4, 5-4, double 4 or 4-3, you will bitterly regret having doubled. On the other hand, there are different situations where although your edge is very small there is no prospect of your being at a disadvantage by the time your next turn comes around, because you won't have a next turn! Suppose you have two men left, one on the five point and one on the two point, and Black is bound to win if you don't get both men off this turn. You must double! You are going to win 19 times out of 36, which is over half the time, so you should increase the stake. You must Charge Black for your throw and pick up the edge in your favour. I trust that by now it goes without saying that Black should accept. The vital aspect of that position is that you have lost the game immediately if you do not get your men off, so Black's ability to double you back is irrelevant. What it comes to is this. More important than the extent of your advantage is the extent of the drama in the situation. If it is a low drama position, so that not much is likely to happen before your next turn, you do not double even when you have quite a big advantage. But if the position is one of high drama, so that the game is likely to be won or lost before your next turn, you should be prepared to double with only a small advantage. There are some situations where experts double when the ordinary player would not even consider it. All I have to say about these doubles is, avoid them	until you are an expert. Until then you need to be rich to afford what it is going to cost you. Until one player has doubled, the cube is in the middle. But once Black has doubled you, he has given you an important weapon which he himself does not have, i.e. control of the cube, and if the game gets to a position which would otherwise be equal, you have a distinct edge. First, you may get such an advantage that when you double he has to drop. Yet one piece of luck could have won the game for him. So, by having the cube, you have won a game you might have lost. Secondly, in the situations where you redouble him and he takes (whether rightly or wrongly), you are obviously going to win twice as much, on average, as if he had not earlier doubled the stake himself. So do not double precipitately where you might get doubled back, unless you have a good chance to win a gammon. You should be very wary of taking doubles when you may lose a gammon. For exactly the same reason you should be quick to give doubles in such situations. Doubling still carries the same dangers for you. If you double Black now you cannot double him out of the game later, and so on. But the point is that you have a great deal more to gain than in the situations where a gammon was not likely. Look at the situation in diagram. It is early in the game. You	have an advantage, but the game could certainly swing Black's way. Yet you have a clear-cut double. Look at it from Black's point of view. He may very quickly find himself behind a five point block, with small chance of saving the game, and a big danger of a gammon. He should take the double but he won't enjoy it. 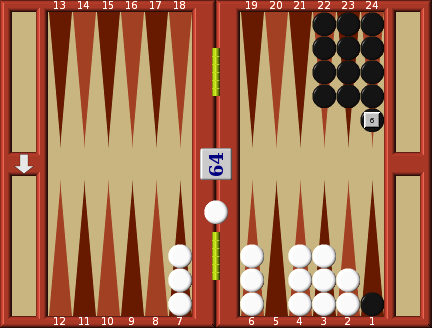 If you cautiously wait a turn in this type of position, Black may well not be able to accept it next time, so that you will have won only one point instead of having a good chance of winning four.